Disclaimer: I invited Sam to participate in a Small Business Spotlight in exchange for a Henry portrait. This post may contain affiliate links. 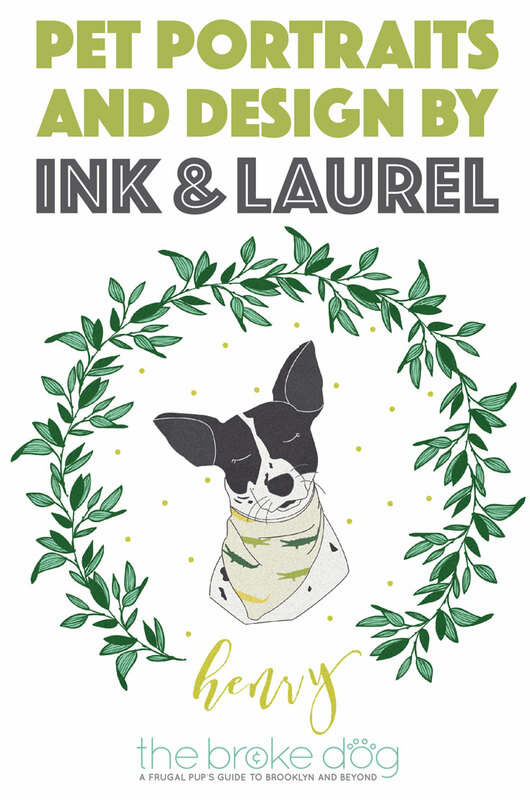 Ink & Laurel is a new Etsy store by Samantha Elias, an illustrator and designer based in California. She creates adorable pet portraits (in addition to couple portraits and beautiful letting), including one of our very own Henry! Check it out to see the entire finished portrait, learn more about Sam and her work, and score a discount on your own portrait! Ink & Laurel’s Henry Portrait! I started Ink & Laurel in May, so I’ve only been running an Etsy shop for a few months. However, I’ve been doing freelance design in the evenings for the last two years. Image via Ink & Laurel. My goal is to encourage people and I strive to do that through my illustration and lettering. So I would describe my business as warm, quirky and fun. I sell handmade canvas banners, greeting cards, prints and custom illustration. My biggest passion is illustration, so I want to highlight my custom illustration pieces. I absolutely love drawing portraits of couples and pets. I have two dogs! They are my babies and I’m completely obsessed with them. Their names are Riley and Zooey and they are the scruffiest, cutest little pups. My name is Samantha, but I go by Sam 99% of the time. I work full time as a graphic designer at an architecture firm and run Ink & Laurel on the evenings and weekends. I’m newly married to my boyfriend since high school and our favorite things to do are play with our dogs, eat pizza or thai food and binge watch things on Netflix. Working as an artist and starting a business is the most challenging thing, but also so rewarding. I just want to encourage people to not settle. Set a goal and go chase after it! Go to your local dog park! My dogs love running around and playing with each other outside. Plus it tires them out and you’ll get lots of sleepy pup cuddles when you get home. Win-win for everyone! Check out Ink & Laurel at their website, Etsy shop, and Instagram — plus, take 10% off any purchase with code SPOTLIGHT! Well, I guess I know what I’m getting Zoe for her gotcha day! I will check this out. I’m always looking for new styles to capture images of my fur babies. Isn’t she talented? Her prices are reasonable, too! Those are some really cool ink portraits! Aren’t they?? I fell in love! Oooh, that’s really beautiful!! I definitely will check out the Etsy shop! It’s also such a nice gift for dog people!! It really is a great gift! Her prices are reasonable, too. Wouldn’t it be a perfect holiday or “Gotcha Day” gift? Oh, we definitely need to look into this! How neat. Those illustrations are adorable. I love pet specific artwork like this! Me too! I can’t wait to hang Henry’s in my apartment! I’m always a little jealous of artistic people. Wow! I love the vintage feel of Samantha’s work. Beautiful portraits. I’m so in love with Henry’s! I’m having a hard time deciding where to hang it. I’m also tempted to commission a matching portrait of my boyfriend and I to hand next to it! That is a great portrait of Henry! Samantha is quite talented! These illustrations are adorable. They remind me a lot of my Rosa Doodle logo! She is really talented! Henry’s portrait is adorable. I like the donuts hanging! Aren’t the donuts fun? I love it! I love seeing all the styles! What lovely illustrations, Henry’s came out great! I also really like the bean illustration, that is too cute! I agreed – Bean’s is adorable! What an awesome gift idea! So much talent! These are awesome! She is very talented. beautiful work. Funny, I’m also a Californian with an Etsy store and do pet portraits. Though you were describing me at first! But I have a different style. Love the soft colors she uses. I’ll go give her shop a follow.